This cute guy is waiting for you and now you are going to gobble up all the balls. Just try to avoid them and you will cope with it! Use the bow and throw the arrow! Watch out! Beware of the bubbles and set the best record. You will love the game. 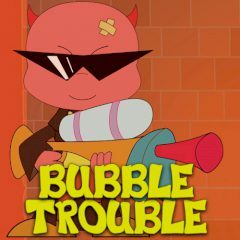 This is the funniest game you have ever played, cause now you must clear all the bubbles and get yourself out of trouble! Do everything to destroy the bouncing bubbles by splitting them again and again with a line from your harpoon gun, but do not let them touch you! As you have already understood, your goal is to collect items dropped to gain advantages and score bonus points by eliminating all the bubbles before time runs out. Are you up the challenge? Then do not waste your time and start the game! Enjoy it!